This is a map of Yorkshire. It is so named as it is the shire (county) of the city of York, ￼or York's Shire. The countryside of Yorkshire is famed for it’s beauty, acquiring the nickname of "God's Own County”, and Yorkshire has many castles throughout the county. 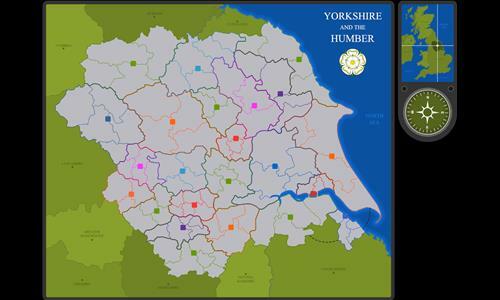 The culture of Yorkshire has been influenced by its history, including the Celts, Romans, Angles, Norse Vikings, and the Normans. The people of Yorkshire are known for being gritty, but fundamentally good people. Review by DanWL on 7/18/2018. Review by warhawk on 11/3/2018. All connections seem good. Played as a game of the week, it was like a knife fight in a telephone booth with 4 players.